So you’ve probably got a few rugs spread around your home. Chances are if you’ve got hard floors such a stone or wood then you’ll have even more. You’ll likely to have spent ages choosing them but once they are down on the floor they become a little forgotten. As most rugs are patterned they hide soiling and marks well and so other than a quick vacuum little love is given to them. 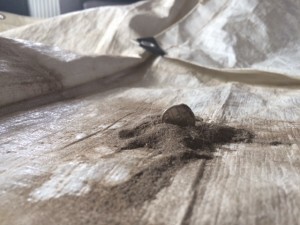 The key to cleaning rugs is dry soil extraction. That’s the posh term for beating the dry soil out of a carpets and then vacuuming it. As much time is spent doing this as what you would think of as cleaning. Here you can see the amount of dry soiling that has come out of a small 6′ x 4′ wool rug. The real suprising thing is that this is after the third session of ‘back dusting’ of the rug, and the previous two had produced even more soiling. 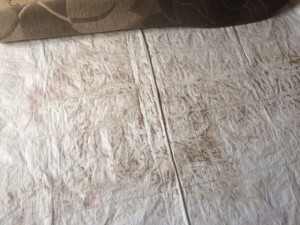 You can imagine the what a mess it would make if you went straight to trying to clean the rug without extracting all that soil – it would simply turn to mud. Hopefully now you can understand the importance of having your rugs cleaned professionally and perhaps more often than you may currently think you should. At The Rutland Cleaning Company we offer a collection and delivery service bringing your rugs back to you clean and dry. If you have pets we have special cleaning solutions that deal with any odour issues. Leaving a bottle of spot cleaner is a fantastic help to every carpet cleaning customer. No-body wants to see their nice clean carpets dirty again. The spot cleaner at least gives customers a fighting chance at keeping carpet clean.